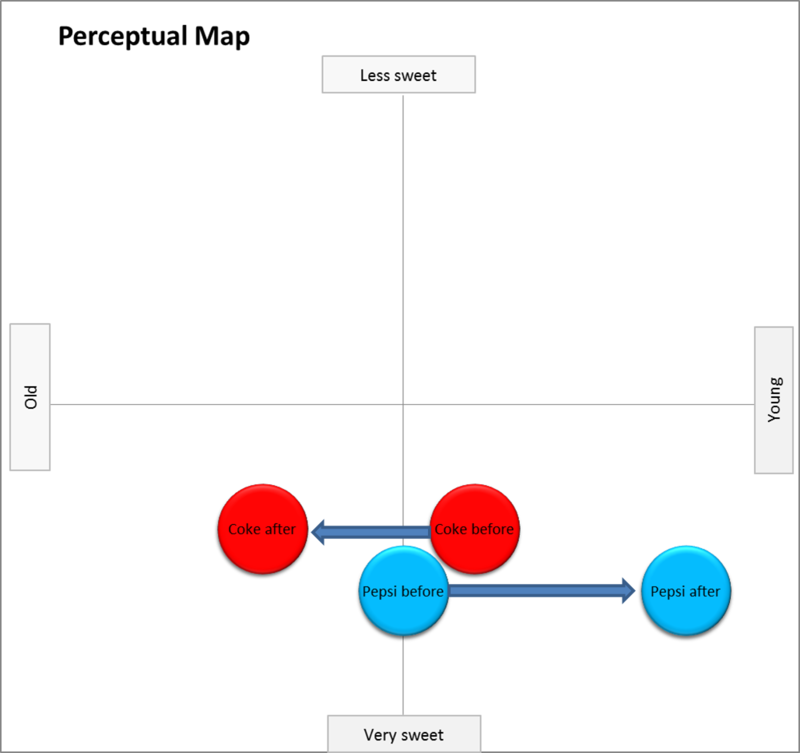 Example perceptual maps for each of these strategies are outlined below. The most common strategic use of a perceptual map involves looking for gaps in the market. 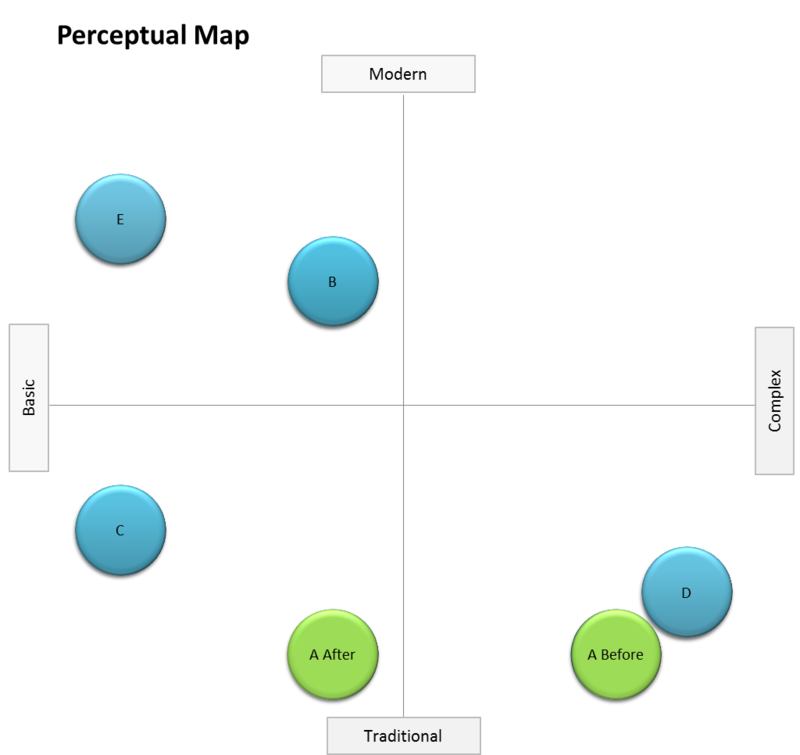 These gaps may represent opportunities because no other firm/brand is perceived to be offering the same mix of benefits and features. 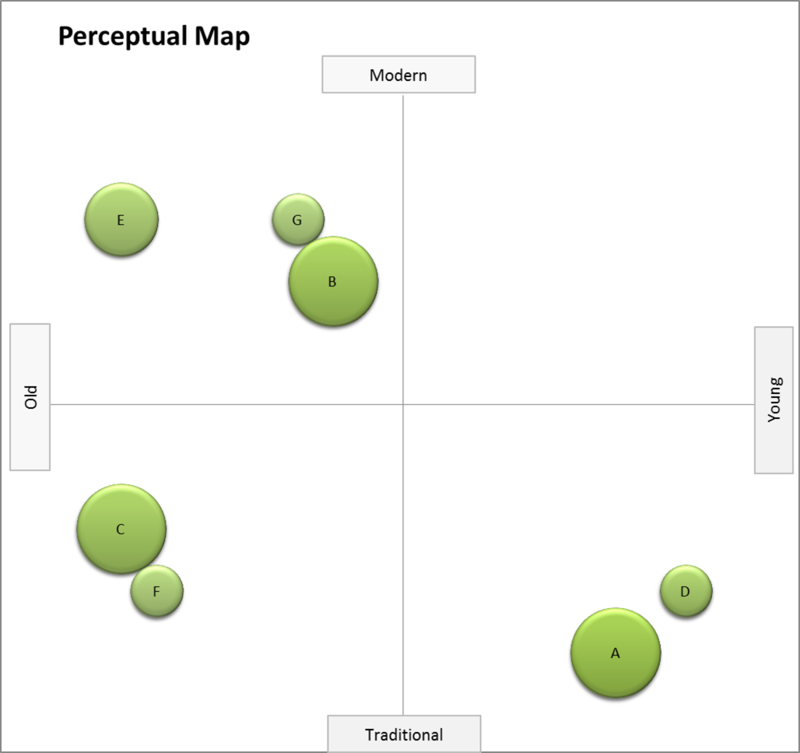 As highlighted in the following perceptual map, the arrow highlights a significant market gap, where there are no competitors perceived to be offering a brand/product that is both modern and more complex (that is, having many technical features). This gap may or may not be viable. 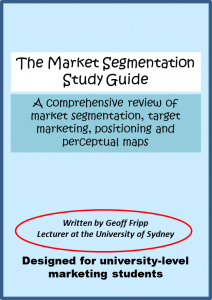 A viable market gap requires sufficient market demand (consumer need) along with the firm’s ability to access the market as well as requiring a suitable profit margin per unit. There are many other strategic options to consider than just looking for gaps in competitive offerings. This is because this approach is simply too passive and too co-operative, particularly for large brands. In the following perceptual map, a firm has made a strategic decision to take over a market position and has launched several brands. As a consequence, it is likely that existing competitor may need to consider repositioning their own brand. If a firm has attempted to reposition one of its brands in the minds of consumers, then it is very important to track how effectively this goal has been implemented. To achieve this, we need to map the consumer’s understanding of each of the competitive brands at two points in time – typically before and after a major promotional campaign. We should find that the perception of all of the brands will move slowly over time. 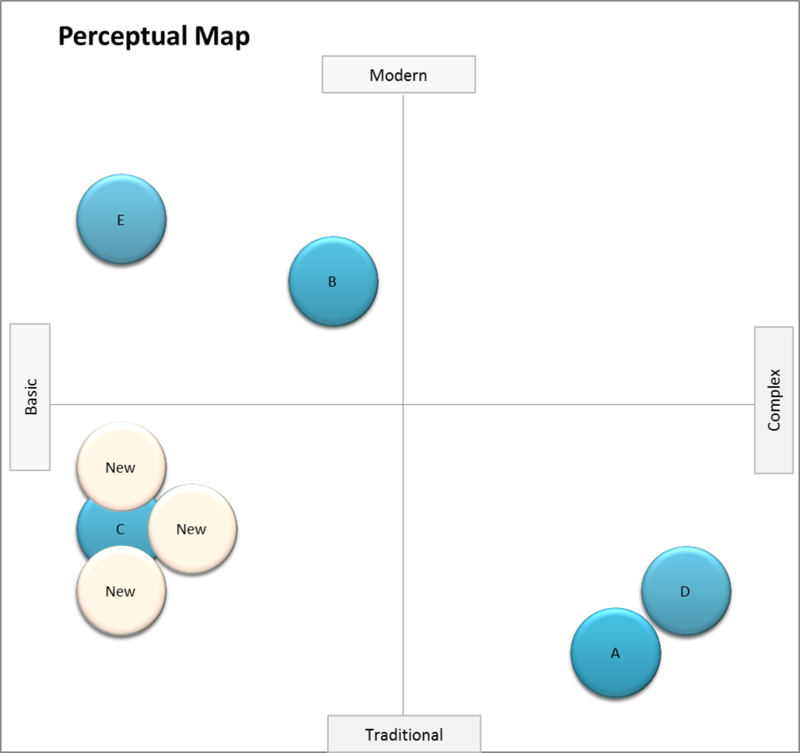 However, in the following perceptual map, only the repositioned brand is highlighted. This is a much harder strategy goal because you have to almost reinvent two brands (yours and the competitor) through the one promotional campaign. However, it can be done. Two famous examples of this are Pepsi’s “choice of a new generation” slogan and Avis with their “we try harder” slogan. In the first example of Pepsi, which is shown simply in the following perceptual map, Pepsi’s appeal to the youth market (the new generation) effectively repositioned Coca-Cola as “old and tired”. Likewise, the Avis campaign had the effect of positioning the market leader as having poor customer service. The complete opposite of looking for a gap in the market is to try and position very closely to a market leader. This is a relatively common marketing strategy for smaller brands. By aligning their brand name, packaging, colors and product design as closely as possible to a major player, the brand hopes that they will pick up some market share. Their goal is for either consumers to confuse the two brands or to perceive that the two brands are quite similar. And as the me-too brand tends to be quite price competitive, it should achieve a reasonable sales volume, particularly from budget-conscious shoppers. 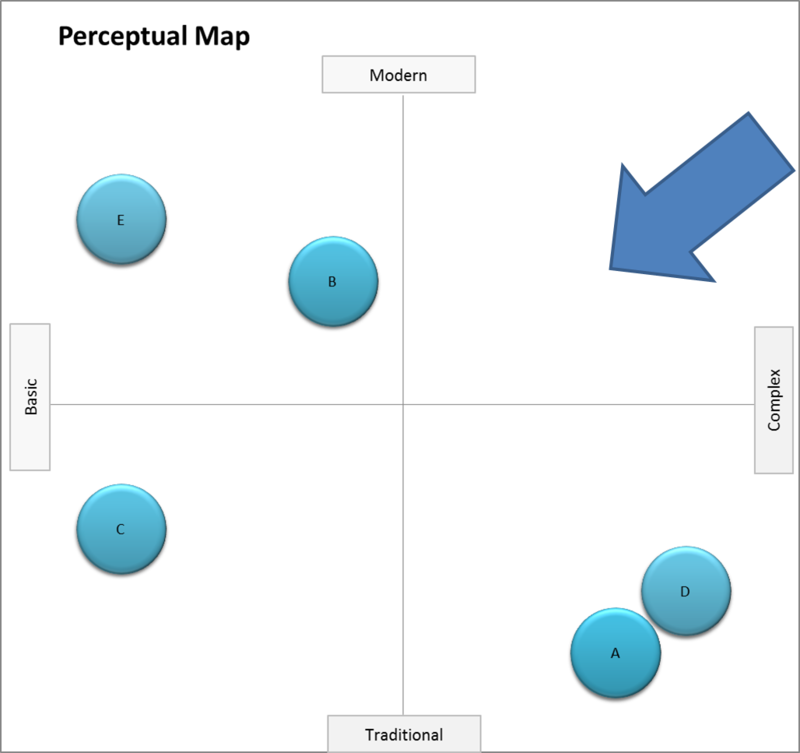 This me-too positioning situation is highlighted in the following perceptual map. In this case, note that the circles vary in size; the larger the circle, the larger the brand’s market share. The smaller circles represent the me-too brands.